Be seen as a Black Knights fan when you put on this Army Black Knights Mens Chrome Synthetic Poly Hoodie Sweatshirt by Colosseum with its front high quality embroidered team logo. 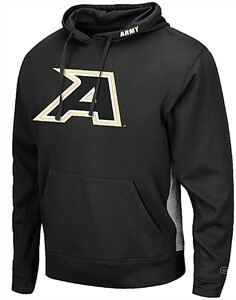 Made in Black with a regular fit body that is made from light-weight 100% poly fleece material that still allows you room for layering; this Army Hoodie can go to the game, the gym, or just anywhere you want to show your school pride. Features include a hood with thick drawcords, a front pouch pocket, ribbing on the cuffs and hem, and direct embroidered school name on the left side of the hood.